I'm not one of those people who hates winter. I like how the trees look under a fresh coating of snow. I like cuddling up with a soft blanket and hot cup of tea at night. And I actually kind of like bundling up in warm scarves and sweaters and colorful hats. But I'd be lying if I said I never think about escaping Ohio winters, at least for a little while. I mean, I don't love repeatedly cleaning snow off my car, or driving on icy roads. And I really hate that phenomenon where your nose hairs freeze when it drops below a certain temperature. Add to this fewer daylight hours, perpetually chapped lips, and the salt stains that will plague all my cute boots, and there are certainly plenty of things to want to get a break from. Knowing that winter was indeed coming, my partner Elliot and I were already talking about a pre-winter getaway back in July. We talked about going to Puerto Rico or California. Maybe even Belize. 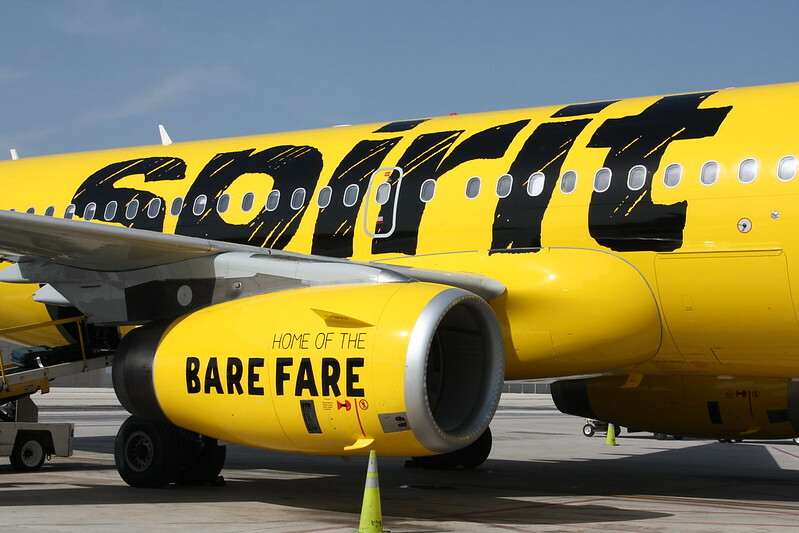 But then we found out that Spirit Airlines was going to be starting direct flights from the Akron-Canton airport to various cities in Florida in late November. And just like that, our destination was set: We decided to go to Orlando for a long weekend in order to act like the kids-at-heart that we really are. We decided that “go big” was going to be our motto in Orlando. I knew I wanted to go back to Universal to visit both their Harry Potter parks, but we also kind of wanted to visit a Disney World park since Elliot's only experience with Disney has been at Disney Land in California. 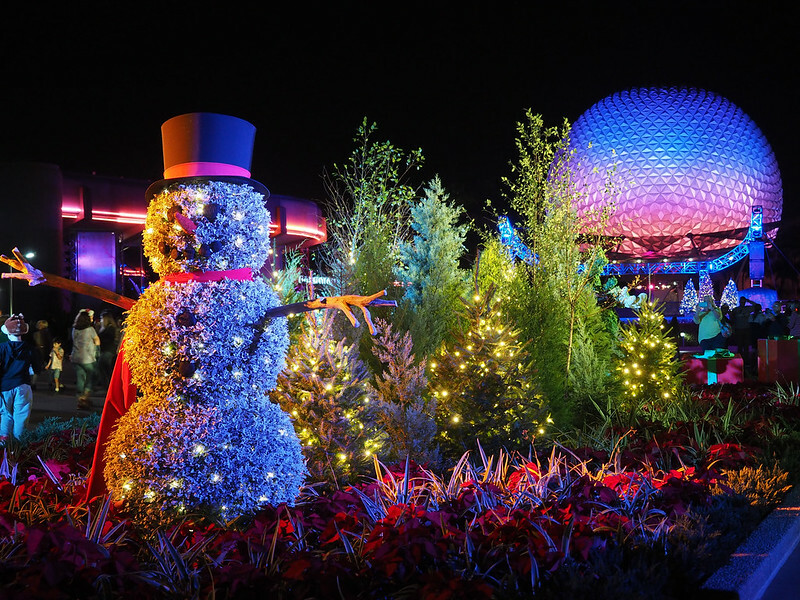 We decided Epcot was the Disney park we wanted to devote a day to, since it's definitely one of the more adult-friendly parks (I mean, you can pretty much get alcohol at every country in the World Showcase!). 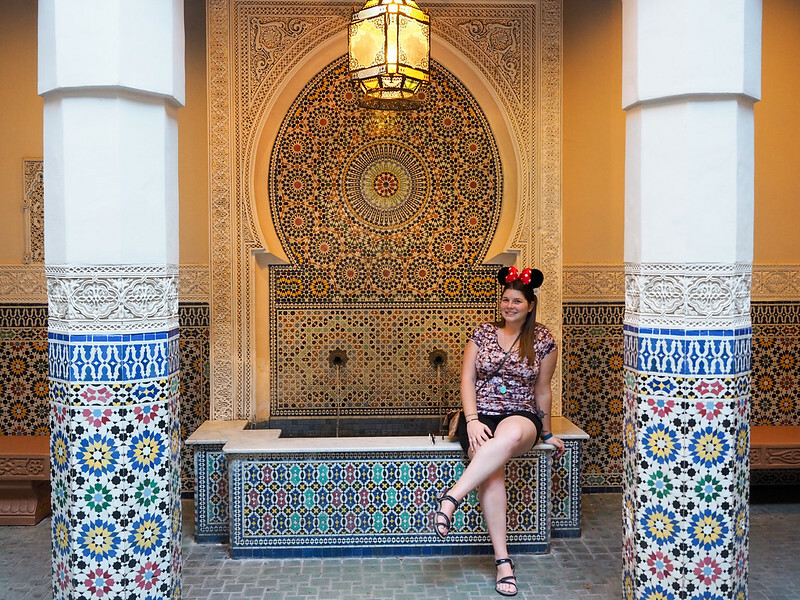 We rode the iconic Spaceship Earth (because, I mean, Epcot), watched Taiko drummers in Japan, admired the stave church in Norway, took photos with tiled fountains in Morocco, and even met Marry Poppins in the United Kingdom. And then we splurged (and I mean it) on dinner at the Biergarten in Germany. 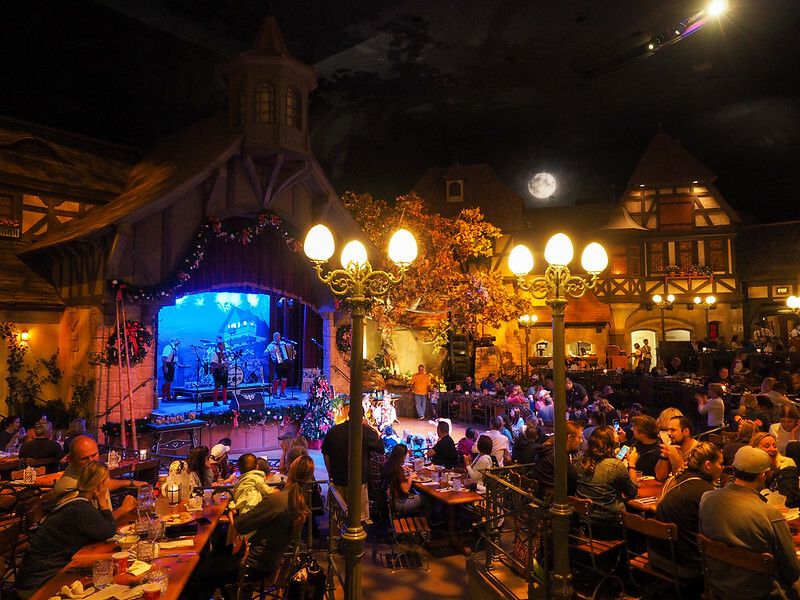 It really did feel like a German beer garden, complete with atmospheric decorations, long shared tables, live music, and of course liters of beer. The food was also really good, though I don't know if I would pay $40 per person for a buffet again! 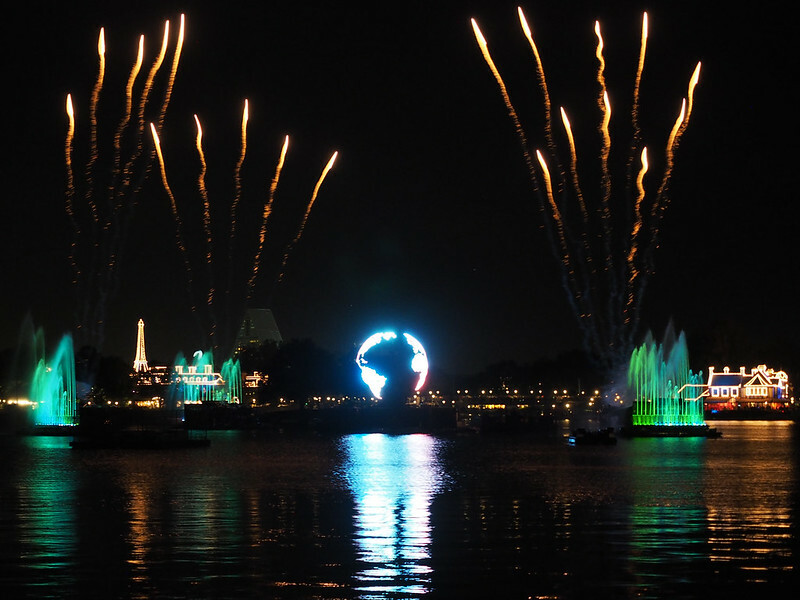 We rounded out our night in Epcot by watching the IllumiNations light/fireworks show, which is easily one of the best I've seen on my travels – it's definitely worth sticking around for! The next two days were spent at Universal Studios and Universal Islands of Adventure. While we did hit up rides like the Hulk Coaster, the Rip Ride Rockit (SO FUN), Revenge of the Mummy, and the new Skull Island: Reign of Kong ride, I would be lying if I said we didn't spend the majority of our time in Hogsmeade and Diagon Alley, the two Harry Potter parks. We drank lots of butterbeer, had a meal at the Leaky Cauldron, rode the Hogwarts Express, and giggled like kids when we walked into Gringotts. I also bought an interactive wand and made it a mission to do all the “spells” in both parks. I was terrible at it at first, but got pretty good at swishing and flicking by the end of our second day! If anyone tries to tell you that these parks are just for kids (or for adults traveling with their kids), don't listen to them. We had tons of fun as adults, too. 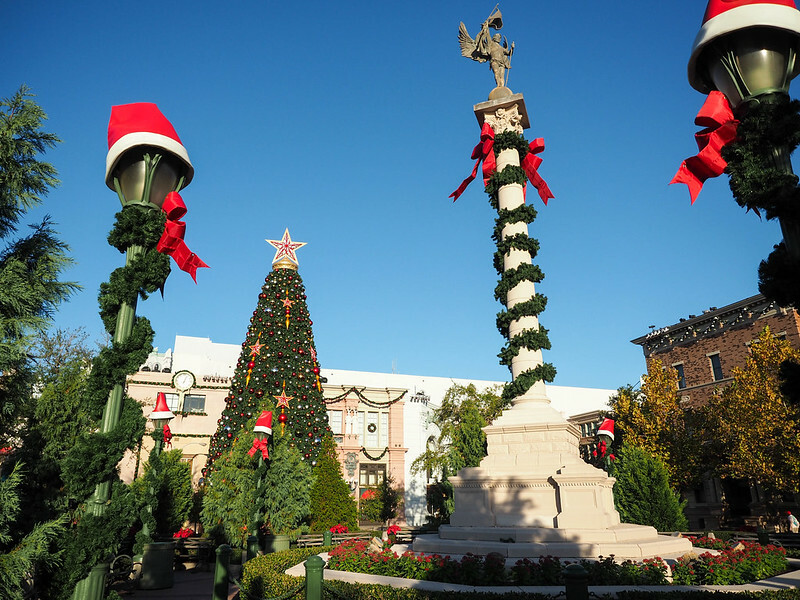 Visiting in early December meant that all the Orlando parks were already decked out for Christmas. 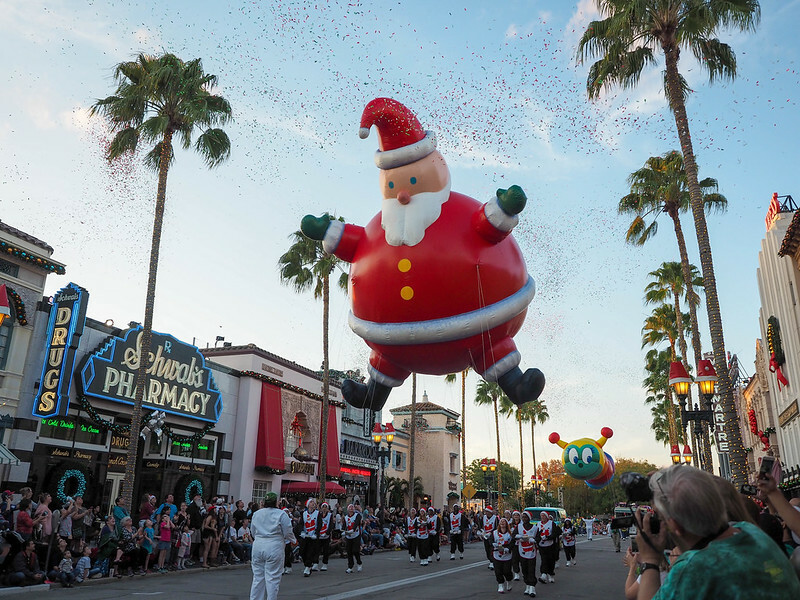 We admired the tall Christmas tree and holiday-themed topiary in Epcot, and got Christmas-y at Universal with both the Macy's Holiday Parade and the Grinchmas Who-liday Spectacular show. Even though this Ohio girl had a hard time believing it was the holidays while wearing shorts in sunny, 75-degree weather, I can't say that I hated it. After our Biergarten splurge in Epcot, we tried hard not to break the bank for the rest of our meals. Luckily, you can find a lot of affordable food at Universal's CityWalk. 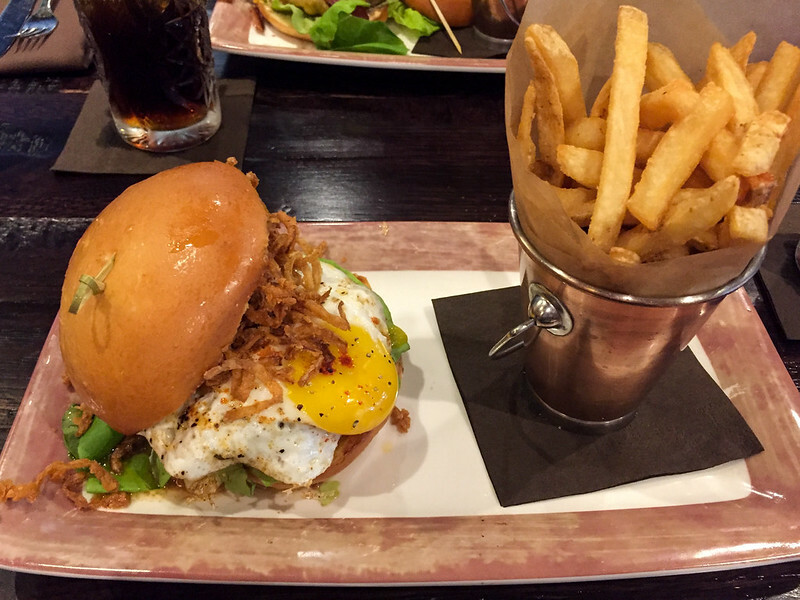 The Cowfish – When I first saw “Sushi Burger Bar” on the side of this place, my immediate thought was “No.” But one look at the menu quickly changed my mind. 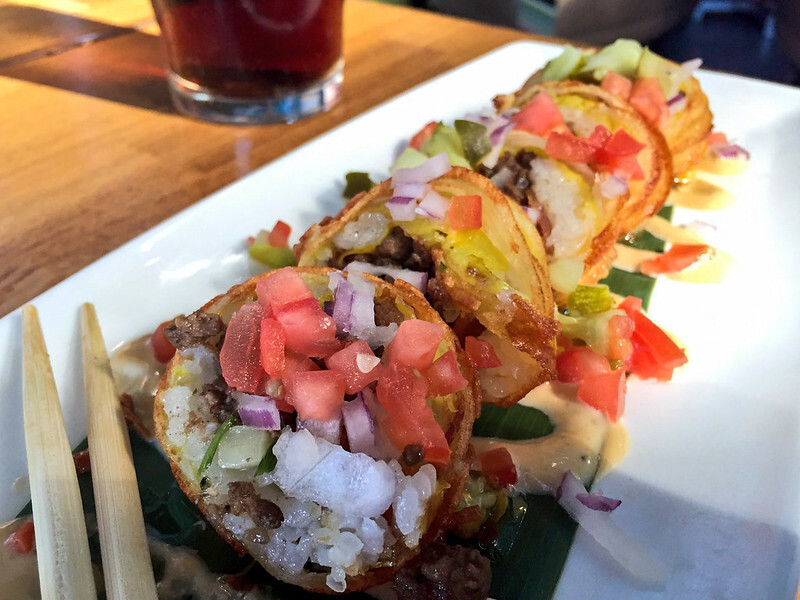 Cowfish does both sushi and burgers, but is probably best known for its “Burgushi” – sushi rolls created using burger components, and sandwiches created using sushi ingredients. We ordered some of the burger sushi, and it kind of blew my mind. Pat O'Brien's – After going to New Orleans for the first time in November of this year, I'm now kind of obsessed with NOLA food. So when we discovered that CityWalk has a New Orleans-themed restaurant (complete with courtyard patio and dueling pianos), I insisted we eat there. The shrimp po' boy was pretty good, and it was nice to get a red beans and rice fix. 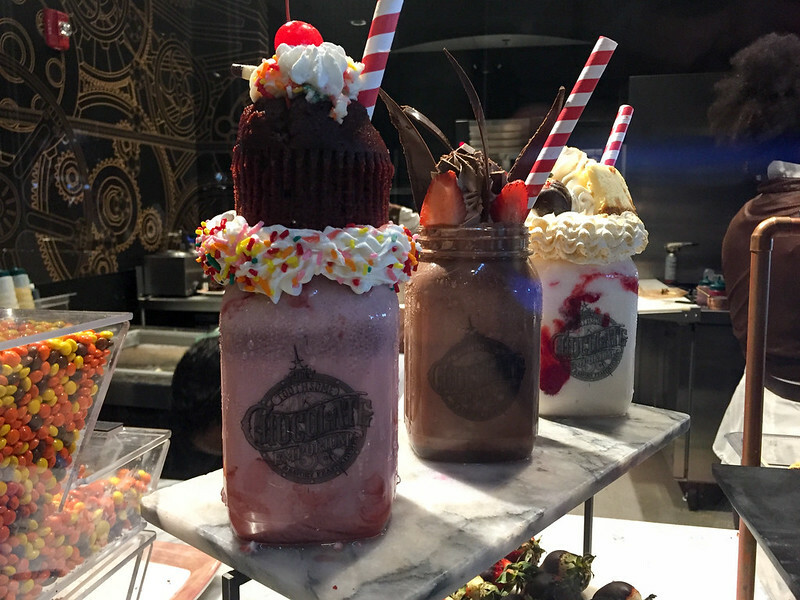 Toothsome Chocolate Emporium & Savory Feast Kitchen – On our last day in Orlando, we decided to go for lunch at the new steampunk-themed restaurant and dessert bar on CityWalk. The theme is really fun, and you'll find hints of chocolate in many of the main dishes. I went with a burger (which was yummy), and we shared an amazing chocolate dessert. I also ogled the ridiculous milkshakes that I couldn't drink because of mild lactose intolerance. Note: There are affiliate links in this section. Since we were spending the majority of our time in Orlando at the Universal parks and CityWalk, we decided to stay in one of Universal's on-site hotels. 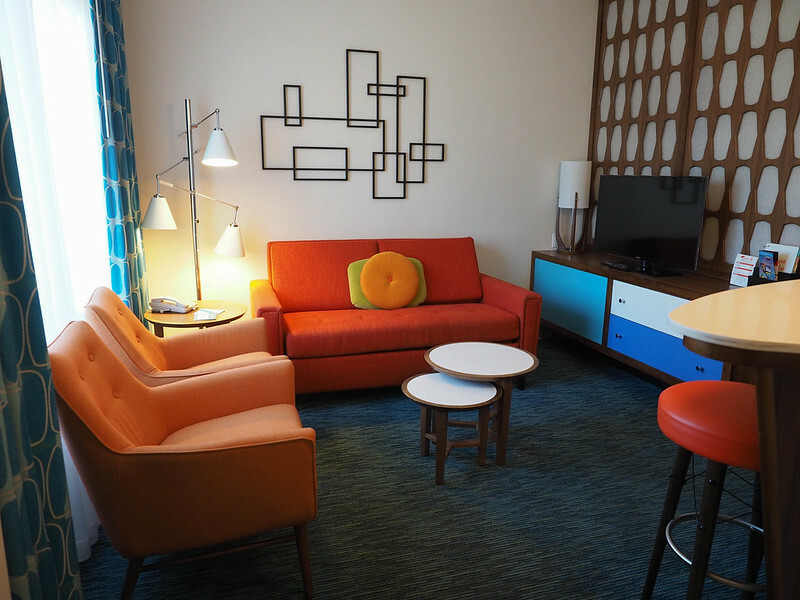 We stayed at the Cabana Bay Beach Resort, partly because I really love its retro theme, and partly because it’s the most affordable of the five Universal properties (rates start at around $125 per night). Along with the retro theme of the hotel, it also has two pool areas, a Starbucks, a diner, a bowling alley, and an arcade. The benefit of staying at the Universal-affiliated hotel is that you can get into the parks an hour before they open to the general public (great for getting on rides before there are any lines). Cabana Bay also offers a free shuttle bus to CityWalk that runs from 7 a.m. to 2 a.m. each day. Any of these make great bases for visiting both Universal parks. If you can't make up your mind, compare prices of hotels near Universal here. Like I mentioned before, the reason we chose to go to Orlando for our long-weekend winter getaway was because Spirit Airlines just started up new direct flights from the Akron-Canton airport to various destinations in Florida. I LOVE the Akron-Canton airport (it's so much smaller and less-stressful than its Cleveland counterpart), and I've flown Spirit in the past without any issues. Spirit IS a budget airline (i.e. one that charges extra for things like carry-on bags and seat assignments), but as long as you know what to expect going in, you shouldn't run into major problems. Our flights left and arrived on time, the crew was friendly, and Elliot and I even got to sit in the “Big Front Seats” on the flight home. I would absolutely book this route again to Orlando, especially considering that the “bare fare” for these flight start around $35 one-way. 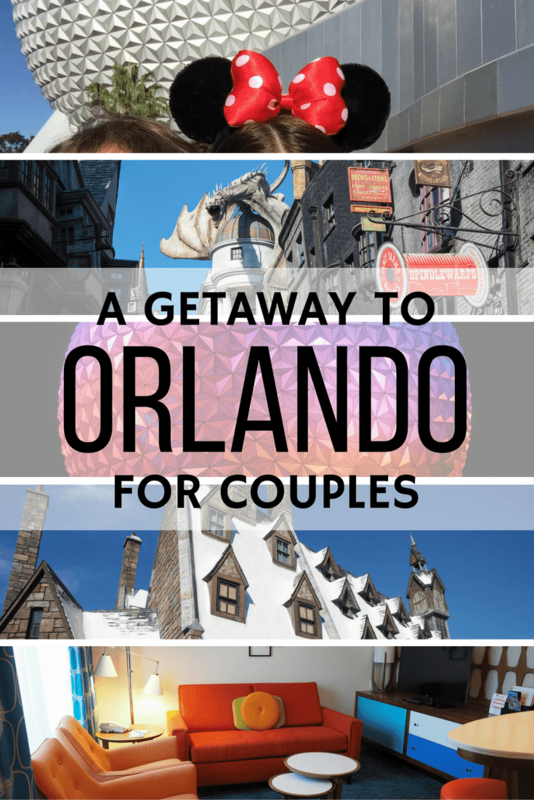 Have you ever taken a long weekend with your significant other in a place like Orlando? *Note: This trip was in partnership with Spirit Airlines and Universal Orlando Resort. But, as always, all opinions (and need to own Minnie Mouse ears) are 100% my own. It was both really fun AND delicious! One of our favorite meals in Orlando, for sure. This is precious! I’d love to do a “kid-at-heart” vaycay with my sweetheart. It sounds like so much fun! Also…is that an entire cupcake on top of that milkshake? Because that is the best idea. It was a ton of fun. And YES, that’s an entire cupcake on top of that milkshake! I haven’t been able to return to Harry Potter World since before the second park was built. What is this interactive wand magic?? Now I really want to revisit! I really liked your video. I would love to do something like that. What kind of camera did you use for that? Something small and easy to carry around the park? 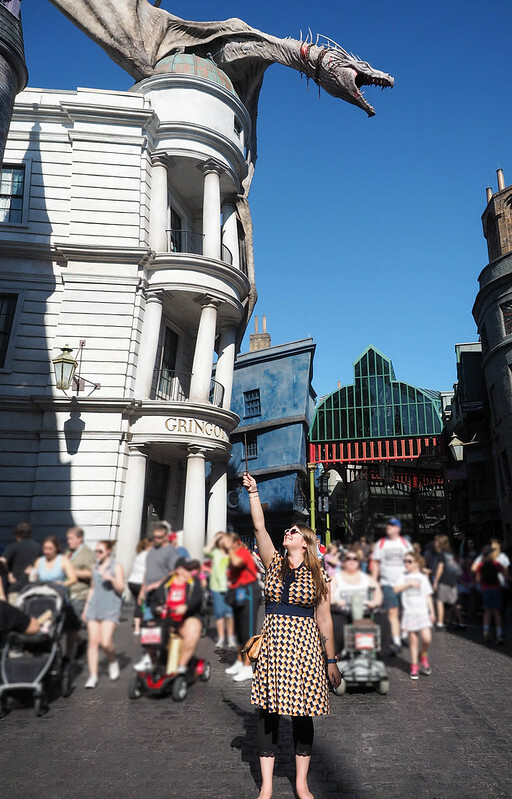 The interactive wands are so cool – there are little bronze markers on the ground all over the park. You follow the wand movement depicted and do a “spell” that makes something happen (like a book open or lights turn on, etc.). It was really fun! And the video was mostly shot on my Olympus OM-D E-M5 Mark II, which is a regular camera. But I ran out of space on my memory card before the end of our stay, so a couple of clips were just shot on my iPhone! 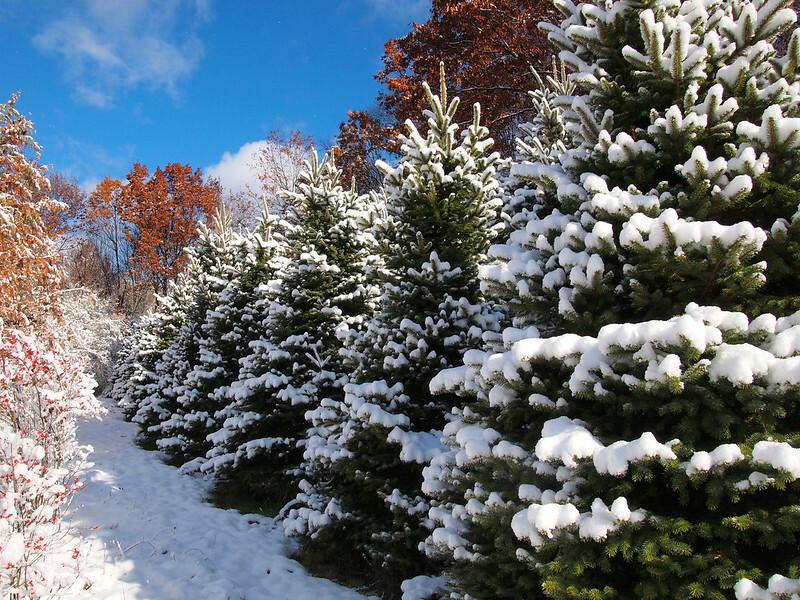 I like winter, too…as long as I can escape it at least once a season! Where did you get those sunglasses? I love them! Yup, getting at least a little break from the cold is always nice. 🙂 And the sunglasses are from Target! I flew Spirit to Orlando a few weeks back with just a personal item (just a big purse) and had no complaints! It’s so cheap from Atlanta at only $95 round trip! Yeah, the prices really are good (and sometimes even WITH paying extra for things like bags they are still the cheapest). I’ve flown them a handful of times now and have not had any issues! I’m trying to book more weekend trips with my husband this year and just saw some Orlando deals out of our local airport on Southwest. This has me really considering going and just staying at Universal for two days. We are both huge Harry Potter fans and haven’t been to the parks yet but I’ve heard only amazing things about them. Hmm… Thanks for the inspiration! 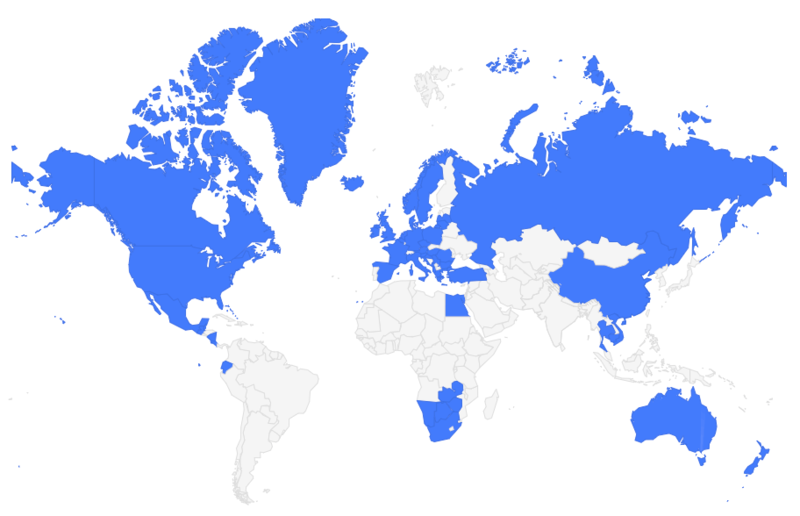 If you can get cheap airfare, then definitely DO IT! 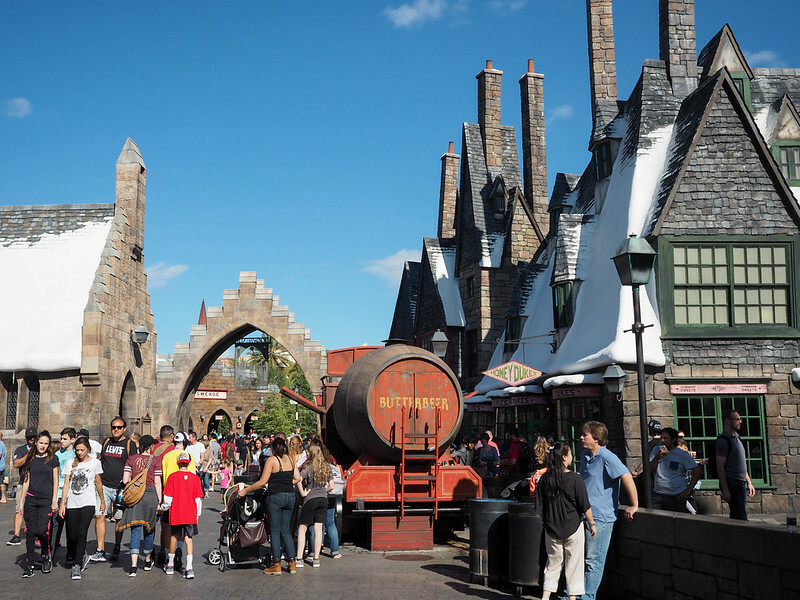 The Universal parks are fun even for adults – and *especially* if you’re Harry Potter fans! Oh man, if they built a Harry Potter hotel, I would want to live there! This is such a great guide! I would love to be able to visit Orlando for a long weekend 🙂 The parks look magical at Christmas! It’s fun, and will definitely bring out the kid in you!